It’s clear that this is no longer just about tuition hikes. The tuition hikes go hand in hand with new user fees for health care, and rising rents, food prices and electricity rates. The tuition hikes come in the context of condos taking over our neighbourhoods, evictions and expropriations for the sake of “development”, immigration officials deporting our neighbours, cops shooting people in the street, and the imprisonment of friends and loved ones. Austerity measures are coupled with increasing repression. Law 78, an attack on the right to organize collectively, is only the most recent example of this. Over 2500 people have been arrested during the student strike and some of them have been exiled from Montreal until their trials. In May, rumours started to circulate about a social strike in the coming months. For many people a general strike happens through a union vote, but, for unions, a strike is illegal during times when the union is not bargaining for a collective agreement, and for others there is no union at all. So how do we strike against austerity and increasing repression, especially when our unions hands are tied or we have no union? And what the hell do we mean by social strike? The student movement has been able to do what it has done because of collective organizing in schools. This spirit of collective organizing could spread to neighbourhoods and workplaces. One way that has been happening is through autonomous neighbourhood assemblies meeting to find ways to act together and build power outside of the government. Another way this happens is through collective workplace organizing without union approval, which can take the form of a wildcat strike. Another way the student movement has been able to strike for so long is because of their willingness to take action to make the strike effective. Between targeted economic disruptions and picketing the universities, the students have been able to block bridges, stop traffic downtown, shut down their schools and more. What could this look like for us and our neighbours and co-workers? In St-Henri, neighbours marched to a disruption of the Grand Prix together. In Villeray, the casseroles joined up with the night demo downtown night after night. In Barcelona in March this year, people involved in a general strike barricaded their neighbourhoods, picketed downtown and shut down businesses. We know that in August the government will try to force striking students to go back to school. Law 78 will likely be used to justify police attacks on students, criminalization, and heavy fines. The movement will require widespread support to fight back against these attacks. 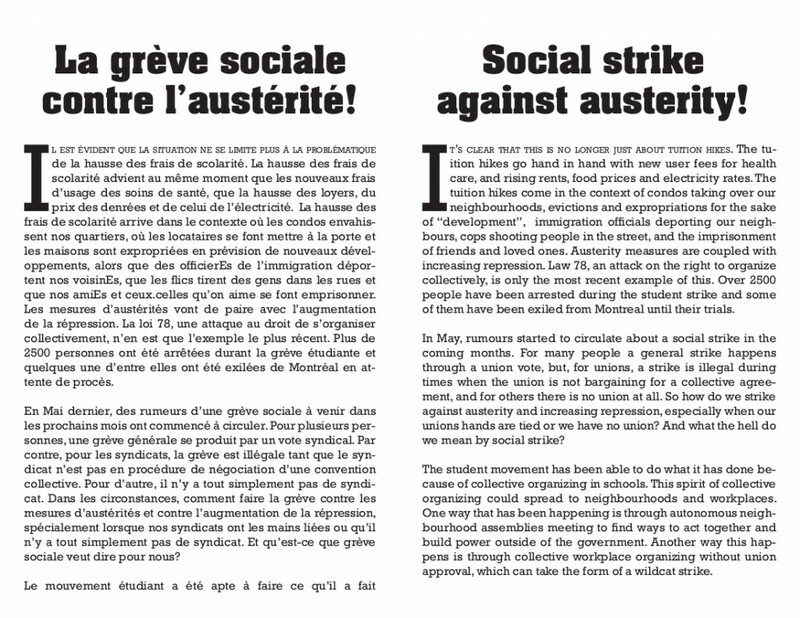 We believe the social strike can be an effective strategy for advancing the student strike, and resisting all austerity measures. When we organize ourselves to shut down our schools and workplaces, we demonstrate our collective power, and give ourselves the opportunity to act in solidarity with others who are struggling alongside us.